Anish has built a career within retail payments at leading banks. Prior to TranServ, Anish has held senior positions at HSBC and Citi where he developed and managed payment products, a portfolio of customers and enabled distribution across the country. Anish has gained experience working with leading international organizations while being focused on developing solutions suited to the Indian market. 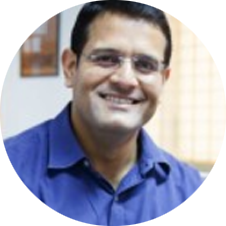 He brings with him a good understanding of processes, business discipline, management of high performance teams, and delivery of business plans along with a rich experience of the Indian payments market. TranServ was Co-founded by Anish with a primary objective of expanding electronic payments in India and reaching out to new customer segments. Today he is leading TranServ in its vision of redefining the way consumers and businesses pay and helping build payment solutions forCorporate, government institutions & retail customers in a cost effective, secure and highly efficient manner. Anish has lead TranServ’s team and lucratively positioned it as the bank’s extended arm and partner in reaching out to the huge under-banked section within India – where cash payments was the inconvenient but only option available. Upgrade to the Good Life with Dhani Pay and get instant loans on just a click.